Home»News»Blog»What Happens When It Snows During Endurance Testing? You keep flying. And flying. And flying. Here at CyPhy Works, we test our drones a lot. Many of these tests last for days, as we confirm our PARC drone’s flight endurance. It snowed heavily in the middle of one recent flight, but that didn’t make a difference to the air vehicle or its ground support equipment. 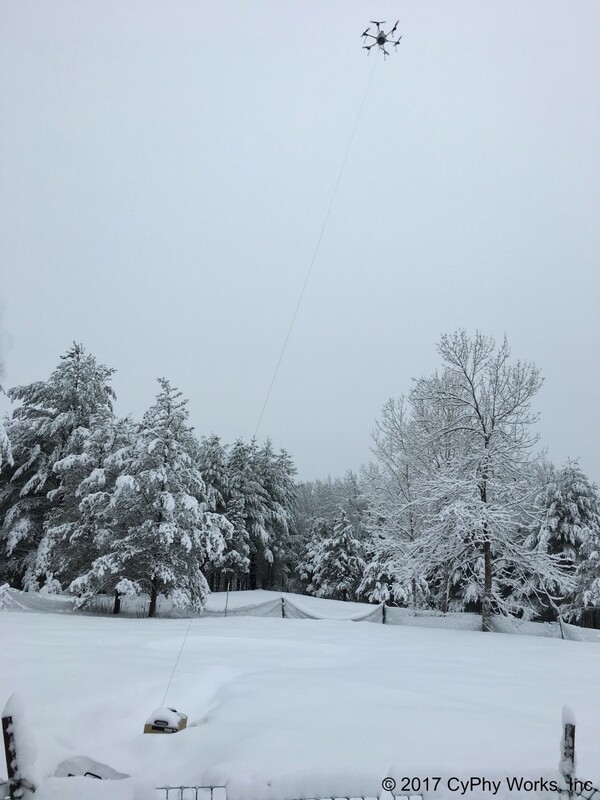 You can see the ground equipment, nearly buried in the foreground, still supplying power and communications via the tether. The snow didn’t matter. The gusty winds didn’t matter. It stayed up, autonomously keeping both altitude and position, and all parts of the system functioned flawlessly without human intervention — no footprints or landing marks in the snow. So bring on the weather! We are just as rugged and ready for anything as the people who need us to fly.